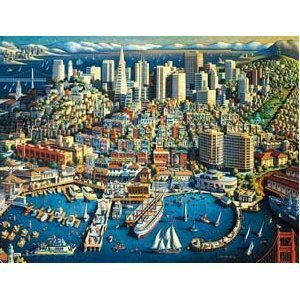 Puzzle size: 19.25" x 26.75"
Comes in a beautiful suitcase! About the artist, Eric Dowdle: Eric was born and raised in the heart of the west. Growing up in Idaho and Wyoming, he spent his early years on the family farm. His parent's example of hard work, fun, and patriotism, has had a lasting influence on his art and life. Eric's unique artistic style brings to life the places we live, work and dream. Perhaps it's his sense of joy in the little things and his ability to capture excitement in seemingly mundane that make his art so perfect for puzzles. So grab your suitcase and explore America! Discover your imagination, and experience again all the simple pleasures of life.